The Celebration portfolio contains a collection of art f rom Durban artists working with the theme of celebration. 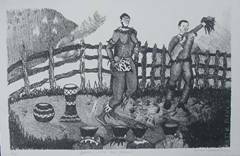 It was printed over a period of two years (1995 – 1996) by Greg Hayes of Stepping Stone Press, a collaborative lithographic printing studio where artists work to produce limited edition original lithographs. All works in this portfolio are printed on BFK Rives 250gsm paper. Each print containes the printer’s embossing seal (two feet) on the bottom righthand side. The Printer, the Studio and Bartel Arts Trust each receive a portfolio, as does each of the participating artists. The remianing 21 portfolios are available for sale to the public as a means of funding the project. The project was made possible with the support of the Bartel Arts Trust. There are 16 lithographic prints measuring 33.5 x 50.5cm for landscape and 50.5 x 33.5 for the portrait images. The printed edition was limited to 40 sets. Editions 19/40, 20/40, 22/40, 31/40 and 37/40 remain available.